being little • bristol uk fashion & lifestyle blog. : 2000 FOLLOWER GIVEAWAY!! Okay, I'm doing this a week and a half after I said I'd be doing it... but at least I'm finally doing it! As a MASSIVE THANK YOU to all of you lovely people who read my blog, I'm holding this bumper giveaway, as I recently hit 2000 followers on Google Connect. 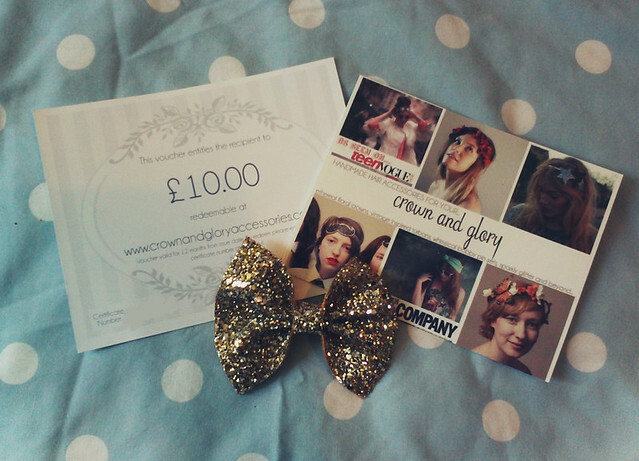 A gorgeous sparkly bow and a £10 voucher from Crown and Glory! 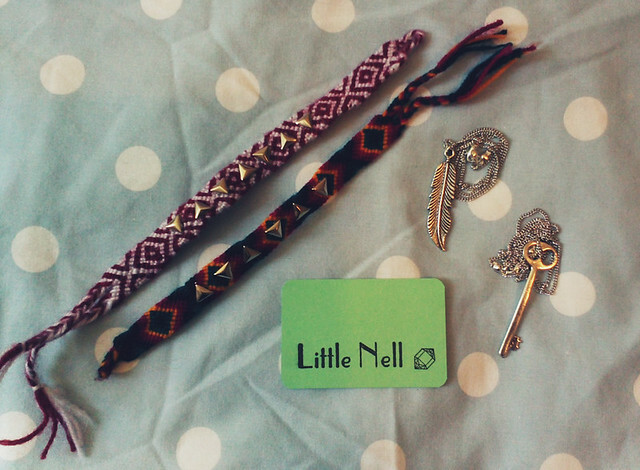 Two friendship bracelets and two cute pendant necklaces from Little Nell! Two super fun necklaces from Me & Zena! 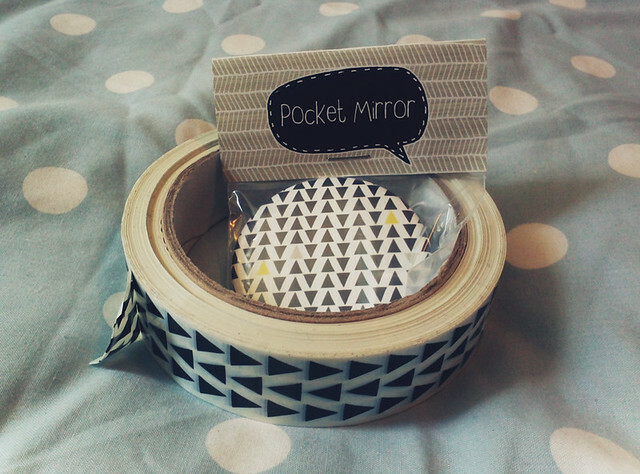 Some awesome tape and a cute pocket mirror from Seventy Tree! 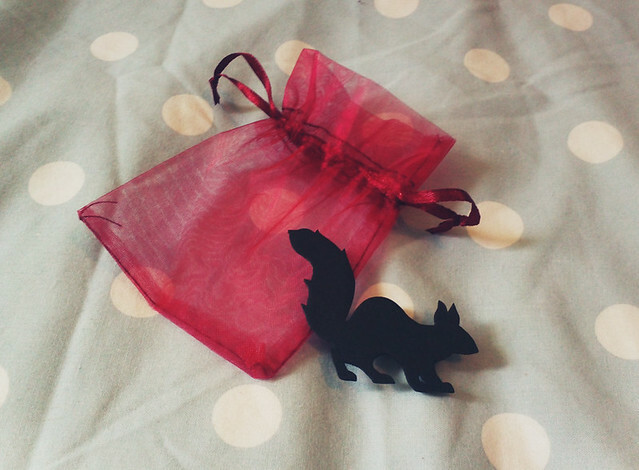 An adorable squirrel brooch from Oh My Clumsy Heart! 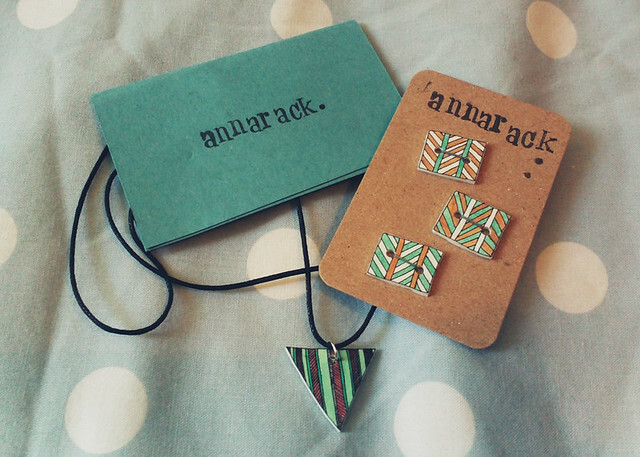 A handmade necklace and amazing buttons from Annarack! 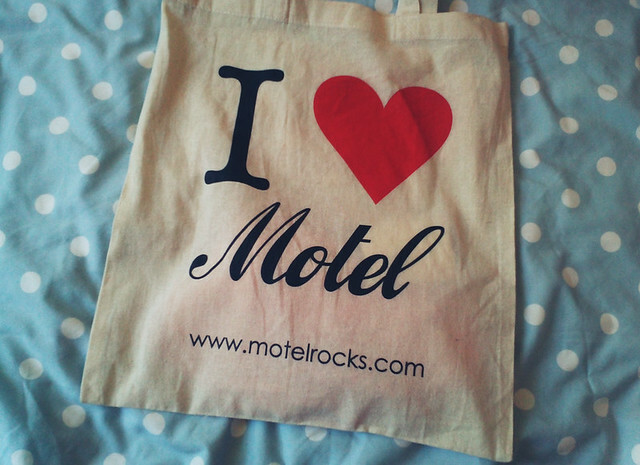 A tote bag and £30 voucher from Motel Rocks! 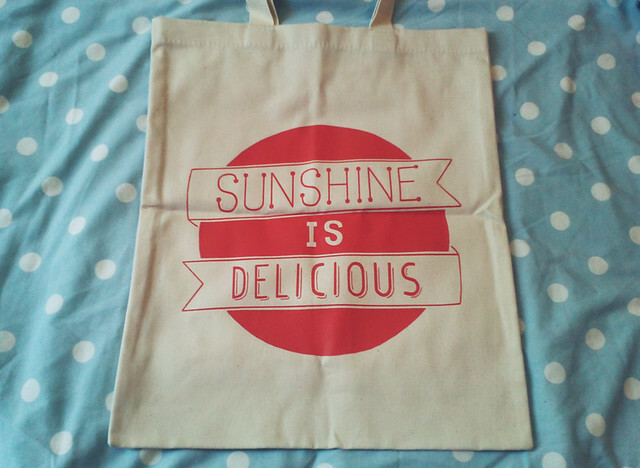 A happy fun tote bag from Alphabet Bags! 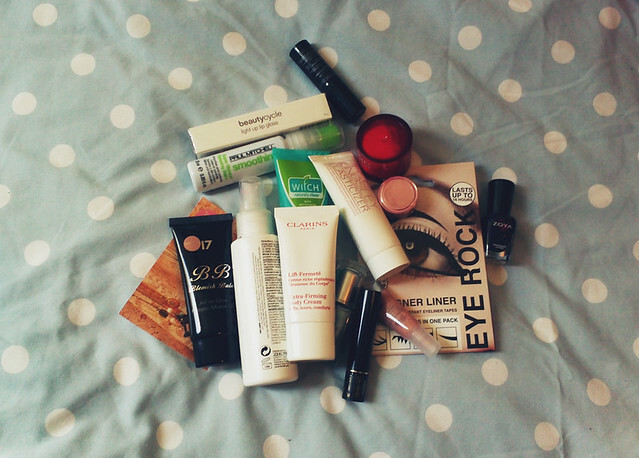 Plus, a bunch of other beauty products, and a few surprises! The winner will be chosen at random & announced on Thursday 26th April! liked them all on Facebook! AMAZING giveaway! Super generous, these gifts are amazing! I follow all the shops on Twitter and I like your blog on Facebook. I think I've gone through and followed everyone involved in the giveaway. Congrats on your followers lovely! I follow you on GFC and bloglovin, and everyone either on facebook (Ria Kod) or twitter (themissdudette) or bloglovin. I also like your facebook page and commented. Great giveaway and congrats on all the new followers!! Wow what a givewaya! I love your blog and the fact you are a fellow cat lover like myself. 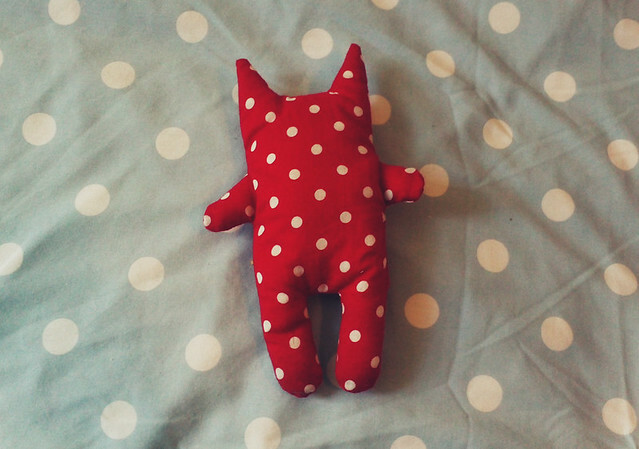 I think the one thing I would love to win is the beautiful cat teddy made by you! Want one so bad. I follow all these shops on twitter. my email is lizziebenton@live.co.uk! Good luck to everyone - and congrats on 2000 regular readers! Amazing giveaway, i love all the prizes. Liked and commented on your FB wall. My FB name is Danielle rose smith. ohhh this is an amazing giveaway!! i followed them all on twitter and liked seventy tree on Facebook. following all :) amazing giveaway! :) thannkksss! OMG! Congratulations on the followers! I love your blog it's one of my favourites! This is such a beautiful giveaway! The winner will be so lucky! I was already a follower and liked all Facebooks/followed each Twitter! Liked all the shops or followed them on twitter! Already a follower of your lovely blog! Congratulations on reaching 2000 followers! Well done on 2000 followers lovely! Enter me :)! your giveaways are always lovely and they always showcase a lot of independent talent which I love! well done on reaching 2000 followers - you deserve it! Oh wow, what a lovely giveaway!! Ahhhh yay - discovered your blog through Crown and glory today and it's proved my find of the day/week/month - love it! Have liked all the facebook pages, followed all the Twitter accounts, and said hi to you on your page too. No more liking or following now, I'm sitting tightly with my fingers crossed. This give away excites me so much! Love all the brands ...most of them I was already following on twitter or GFC! The ones I wasn't I most definitely am now! Have also had a tweet about this too (@madamesquirrel) and written on your facebook wall (Dannii Read)! Congrats on reaching 2000 followers very well deserved! Congrats again on all the followers, well deserved! Oh my, this is simply wonderful! I have followed them all via twitter as I rarely use facey b! Congratulations on the 2000 followers, your blog is amazing, so definitely deserved! Plus, what an amazing giveaway, you're so lovely! Wow - firstly congratulations on your landmark number of followers - it is truely deserved, your blog is so lovely, and I have enjoyed following it from the start. Secondly, it is a testiment to how wonderful your blog is that you have managed to gather so many amazing prizes for this awesome giveaway...I've also go to say,through this comp you have just introduced me to some gorgeous brands I didn't know before, so pay day must come soon!! I would love to be entered. I am, of course, following you on GFC. Also now on Twitter (not sure how I wasn't before)I am also following all the brands on Twitter, or Facebook. Congratulation on your 2000+ followers! Cute giveaways Lyzi! Commented on your Facebook page. i followed them all and did a little tweet too! And thank you for this fantastic giveaway!! Congrats...I love this giveaway and I have seen some amazing new online shops...Thank You! I'm done, followed on twitter or their blog! I'm mainly in this for the triangle tape. this is probably the best giveaway i've seen! exciting! This is such a good giveaway and congratulations on reaching 2000 followers! 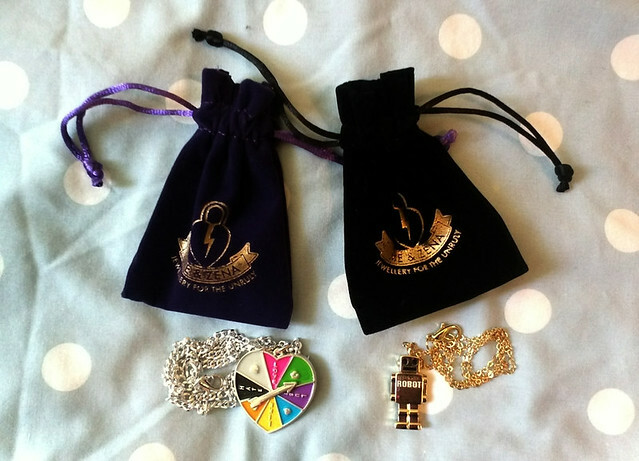 LOVE LOVE LOVE your blog, and this is SUCH a fantastic giveaway. I have liked all the facebook pages and followed the blogs, this is an amazing giveaway, thank you so much for being so generous and congratulations! Oh my goodness, this is an amazing giveaway! I've been a follower since I found your blog a few months back. I liked & followed everyone. Thanks so much for this, doll! liked on Facebook too! My FB name is Jessica Buckley. I follow you on bloglovin (not GFC hope that's ok!). I follow all the shops (some really good ones there, looking forward to properly checking them out now)on their twitter or bloglovin or facebook (if they don't have a twitter). Oh wow, you do the BEST giveaways ever! I seriously love everything on there, I don't have a favourite as they're all my favourites! Weirdly I follow most of the contributors anyway or knew about for awhile, and just realised I never followed them or liked their facebook page. I look the new blogs/shops I've found though! Thanks for hosting this competition *fingers crossed super tight that I win* and mega well done on 2000 followers!!! Also, I like Being Little on Facebook under Lisa Merriman, but I'm not sure if that is an extra entry or not? 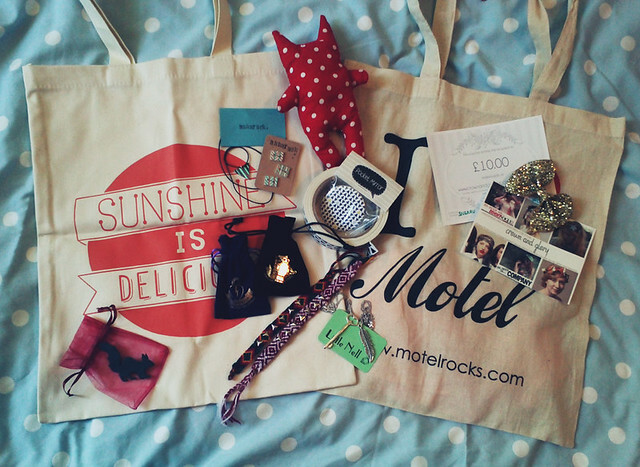 Truly amazing giveaway, I'd be over the moon with those prizes - really super over the moon! I've liked everyone on Twitter as @sera_mcdaid except for Seventy Tree whom I 'liked' via Facebook as The Agoraphobic Fashionista. I have tweeted about the competition including your handle and I've 'liked' your facebook page and commented. Oh wow this is such an amazing giveaway, yourself & the other companies are so generous. I've done what you requested by following, liking all the companies. I've also wrote on your Facebook page. I am a GFC follower as sjess82. I'm tweeting also as @sjess82. Well done on passing 2,000 followers such a huge achievement & I'm really pleased for you. Woop! What a fantastic giveaway. Consider me entered! I've followed all the shops on Twitter where possible (@cupidsbow1414), and on GFC where not (Jane Lambert). I also posted to my blog! Hi, congrats on 2000 and thanks for awesome opportunity! Hi another comment from me, in one of mine I forgot to say I'd commented on your facebook page. Thanks once again for hosting this and congrats again! Such a brilliant give away! Congratulations on 2000 followers! I love your blog Lyzi, I have been reading since summer last year after I saw you mentioned on a post by ella masters I think? I follow you, and liked everyone either on facebook (Neon Gray) or follow them as ThinkOrange. Liked your blog also on FB (Neon Gray), and commented. Well done on reaching 2000 followers, just discovered your blog- wish I had before! Great selection of prizes, it must have taken ages to organise. This might be the best giveaway ever. Amazing giveaway i've seen in a while! Just liked/followed all of the stores for future purchases! Congratulations on hitting 2000 followers, your blog is so lovely! I follow you on gfc, and I've either Facebook liked, or followed the other blogs on bloglovin or twitter. Such an amazing giveaway, congrats on 2000 followers! Facebook liked: Crown&Glory, SeventyTree, MotelRocks, and your very own BeingLittle! (I have also sent in a fb request to Me&Zena). Woah this is a hell of a giveaway! I have followed all the shops twitter/blogs. I have liked/followed all the above, and would love a chance to win! Thank you! =) Good luck everyone! Following your blog on BlogLovin' and following all the above shops on their Twitter apart from Seventy Tree who I am following via BlogLovin'. I was already following everyone on twitter/GFC so yay! My GFC name is Sam x and my twitter name is polkadot_dreams. This is such a great giveaway, thanks for being amazing! Amazing Giveaway Lyzi, Congrats on the landmark! Tweeted about it under @_legseleven! Commented & Liked your FB Page under Kathryn Adams! What a great giveaway! I've tweeted about it and 'liked' your facebook page! ah this would be so cute. followed them all on twitter and followed the one that didn't have a twitter on blogger so crossing my fingers!